Eating gluten-free at a restaurant can be a little easier now with the help of these Gluten-Free Dining Out Cards. 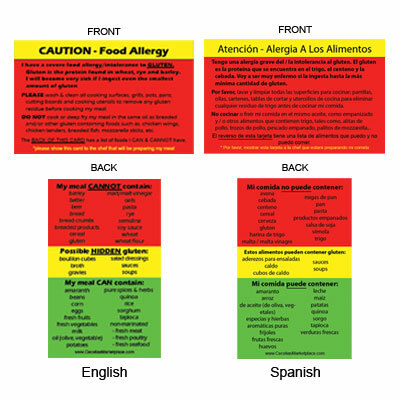 Help educate your waiter & chef about what foods you can and can not have. It is a must have for gluten-free dining out! For individuals with celiac disease or gluten intolerance, eating out at a restaurant isn’t always as fun as it should be. But with Cecelia’s Marketplace Gluten-Free Dining Out Cards, all that can change. Take this handy card along with you every time you go out to eat. Simply hand it to your server or chef. The card clearly states which foods you cannot eat and which you can. It also has tips for avoiding gluten contamination when your food is being prepared. At the size of a credit card, the Gluten-Free Dining Out Card fits easily into your wallet. It’s made from durable, thick plastic so it won’t tear or bend. Order your card today and see how much easier it is to explain to your waiter and chef what gluten-free means.